The Galactic Federation is training new recruits. Using Samus' enemy and environmental data from several missions, an elite group of engineers created the Confrontation Project: A revolutionary virtual reality training program. Since her cooperation was essential for the project, she was chosen to be the first person to try it out. Now she must face the ghosts of her past in the ultimate training mission. 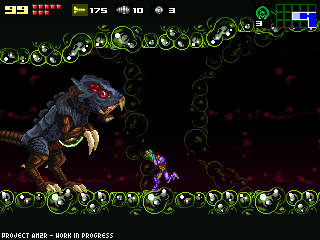 Metroid: Confrontation is a small complete game, set in the Metroid universe. It started as a small tech demo, used to show the engine capabilities. It slowly evolved into what it is today: a small but action packed Metroid adventure, with 3 epic boss fights and many secrets. If you need help finding all the secrets, or you're planning an awesome speedrun, you can find many interesting topics in the Forum, there's a dedicated section for Metroid: Confrontation. ¿Podrías crear una version del metroid confrontation que al final aparezca en vez de la celula de combustible a una tourian con piratas espaciales y el rayo hielo,luego metroid (algún alfa), mother brain, luego coger el combustible y 10 minutos para escapar prque meta ridley te bloqueará? He creado un mod del super metroid (suguiendo las instrucciones que dejaste) pero cuando lo aplico va igual que el default.¿Podrías decirme cómo te lo puedo enviar para que lo pruebes y me digas qué está mal o lo arregles? For the record, it works pretty well on Mac with wine, just in case any other Mac users stumble across this. Hello programmers... I guess this game dont created for ds? well ok then.. i'm dissapointed..
Can you please make this song downloadable? Really nice from what I've played so far. Trying to use non-existing surface. I'll likely still play through the demo. Hey, I'm not sure what I'm doing wrong, but I can't get mc_25 to run... I use a Windows 7 Professional 64-bit system. I tried installing gamemaker 8.1 lite (didn't help), running as administrator (ditto), running in compatibility mode (same), merging the files with the latest am2r demo (de nada), re-downloading from various locations (nope), unpacking with various programs like the windows default and 7zip (still no go), and I also tried restarting. I highly doubt I'm going to run into issues with the amount of memory I have, so the best I can figure is I'm missing a DLL, or Windows 7 just hates yet another great thing in my life. Seriously though, I want to play this so badly! ... Perhaps I can sneak it onto my girlfriend's laptop... I'll check back to see if anyone has any suggestions, but unless you see me replying "fixed", odds are it's still not working for me. Scratch my last post, approved or not. The issue I was having was that the config file had "Resolution=0". Once I changed it to 1, it worked. So if you download the game and it doesn't work, try making sure the game has a designated resolution of 1. I think 2, 3, and 4 may also work, but from the looks of it you may need to also specify that the game runs in fullscreen with "Fullscreen=1"
WOWWOWWOW This game so far has been GREAT i love it but i mean LOVE IT im running a win 7 ultimate and its working smoothly just like i wanted man you the best i really appreciate this ty for taking you time for putting this up :D.
For Metroid Confrontation 3.0, you should make a level select. The levels from 1.1 and 2.0 could be available in the level select under the names "Alpha Zone" and "Beta Zone", and the new level(s) could be called "Gamma Zone" and/or "Delta Zone". Finally, you could choose from three difficulty levels. You could also make the graphics show evidence that it is just a computer simulation. For example, stuff would pixilate when it was destroyed, and magma would look like the not-so-invisible forcefield-of-death in Metroid 2. Explosions could be clouds of pixels (like in WipEout Pure on the four Classic tracks), and when Samus "dies", everything around her just flashes into non-existence while she collapses on the floor, before getting back up as the screen fades out to black. Another idea is to have the new areas "load" in front of Samus' eyes. The level geometry would look like a bunch of colored outlines against a black background, shortly before everything pixilates into existence. This would only happen to areas that you haven't visited before in the current run, though, since the simulation would be constructing it as you went along. Maybe each level could have random enemy spawnpoints, and perhaps even a ghostdata of you (it would be saved into an XML file or something, so you could easily exchange it for somebody else's ghost data). Now, this would all be a pain-in-the-tailhole to code, but I'm sure it would be worth it in the end. Awesome work on this. Finally got around to playing it. Keep up the good work! Hi! First of all, awsome mode! Although I would like to report some bug I've encountered; when you fire you'r beam, it won't activate from certain views. For instance, when you hold onto a wall and aim high/right the beam won't fire. Same goes for low/left, and I believe it would'nt fire from high/right when running eather. Made the difficulty rate increase a littlebit. I'm not sure if it's just my computer but or if everyone encounter it. Just thought I should mention it. Is there ever going to be a MAC OS X version? Mac really deserves its own edition. An excellent tribute to the Metroid franchise that left me wanting more. I stumbled on your game early this morning after having beaten Super Metroid on my old SNES. After a slight button configuration I was good to go as the game plays very naturally. I encountered a few minor issues with the menu screen freezing if you fiddle with the button settings too long. I also had to manually shut down the program in order to exit when I was finished. this game is really awesome. the musics are so dynamic. of course there isn't a lot of features and is very short but the game is still enjoyable. the only down side is that the game is not scary at all. but it's a really good game; thank you very much for this ! The Mirror link still works fine. For some reason, the game will not recognize my Logitech RumblePad. Running Windows 7 Home Premium, I've checked to make sure Windows recognizes the controller & all inputs are working correctly, and I've enabled control pad in the options. I like the way you have added and changed things without destroying the game's feeling. would you port this to linux as well? how can i use my wireless gamepad for this game? Is there a way to convert this game do Nintendo DSlite? It would be cool if you added different scenarios with different set of bosses and boss rush mode. Did you ever get controller support working? I bought an xbox 360 controller to play AM2R and I had a fantastic time with that one. Now I want to play this!!!! @John Osborne: You can use Xpadder to emulate a keyboard and play it with your controller even if the game itself doesn't support a gamepad. Whenever I finish a time attack, the game crashes. MAP.. MAPS :) Where can I find a complete map of V 1.4 100%... that's all items location passages ect. ;) I have seen and got some but they are lacking sorely and all of them are wrong in a few areas as the items are not in that location. ??? I've played AM2R 1.41 and it was really awesome. I loved it. The mechanics (using XBOX360 controller), physics, music, sound-effects, graphics... everything was really well made. The way we play this game is really smooth and so good that it made me addicted to it! This game is better than the versions made by nintendo. However, I tried running Metroid Confrontation (2.5) on my PC, and it appeared: "couldn't read game file". Do you guys happen to know what is this error? By the way, my PC uses windows 7 (version 6.1.7601) 64 bit home professional. Sometime by this December would be nice. It's not that bad.. The movement can use some fine tweaking.. I don't like how if you are walking up to something that is one block like up to her knee cap.. Samus.. CAN'T over come it.. Theres that. Some jumping Like when space jumping when trying to go a different direction she'll sometimes just fall.. :S Yeah everyone wants that.. :P blah. Bad mechanics there. It's been like that since Zero mission .. can it be change by now?! I'm getting sick of having to jump twice left to make a two one to four block jump in the opposite direction?! it's .. I don't get it.. Who makes movement mechanics like that? :S horrible game play.. I was the one that had said before that it is good but really... those areas need major work. Her walking running isn't bad I like how it is raw and rouge movements as no one can run all that smoothly but some can and you'd think for a person who has chozo blood infused into her AND!!! and suit that not only is self sufficient would be able to preform not only walking and running but jumping!! Heh HEMMM at an ease.. with ease meaning having no trouble what so ever in fact having to barely do much at all in the way of anything to get anywhere.. but no.. I hope John Tron does a review of your game.. It's UGH.. It'd fine but needs a major work over. In movement and game mechanics. I'm talking about AM2R not any other game your working on the Another metroid 2 Remake game. The movement and jumping ect her suit her walk running parts. That was me that is the game I am talking about not the others you have done haven't played them yet. well, after giving confrontation a try just now, i have 1 complaint and it concerns the controls in particular. why no D-Pad controls for gamepads? i mean, the joystick is doable, sure, but it's harder to use. the controls here seem about the same as super metroid and i'm pretty sure that game would be a good bit harder/more frustrating using a joystick rather than D-Pad. In Linux, it appears that you cannot use the "second" joypad to control the game. This is necessary for me, as my laptop's accelerometer registers as a joypad. I use aMAC. what's wine? The grape drink,? or software? Loving AM2R. I would never have been able to tell it wasn't official. Tried out MC_25 but the controls are pretty terrible, the start button triggers the missiles lol. Is there any way to change them? THANKS! Great this is awsome it looks fantastic i saw the videos and i can't wait to play it. Just one question can you make the game .gba to play it with emuladores? game doesnt work : error cannot read game file. Very great and awesome work! Thanks a lot for that masterpiece of remake from me and my three kids. Thanks a lot for this great masterpiece of a remake. I and my kids have o lot of fun playing it. "game doesnt work : error cannot read game file. At least this game is still up. Thank you very much! You did a great job. I wish you all the best! Thank you very much for this awesome work, it's incredible, really, a masterpiece !!! AMR2 was awesome and I am trying to run Confrontation but I am now getting an error "Cannot read the game file"..
What is causing this problem? Can anyone help? This game was originally a tech demo for AM2R, and thereby quite a bit older. Try compatibility modes, first. If not, you may have to downgrade software. Who knows. The fight against Kraid is 100% horseshit. I mean, for fucks sake, give a guy non-projectile platform to stand on for the first bit at the very least.